I’ve been busy with other things this week, but as it’s Sunday, and the previous ‘Sunday signage selection‘ proved quite popular, let’s look at a couple of interesting examples noticed in recent wanderings. These aren’t ‘signage’ in the modern sense, but old stones. Still, they signify something, as signs are intended to do. Only one of them makes sense to me at present, while the other is a bit of a mystery. The photo above, worn and indistinct, reads ‘ST CRUX PARISH’. It could have formed one of those quiz type things I used to do. But I wonder if anyone would have known the location of this. I’d never noticed this stone before, despite being interested in the piece of land it’s on. The piece of land is between Stonebow House, St Saviour’s Church, Lady Hewley’s almshouses, and what used to be a garage fronting on to Stonebow, but is now a modern office block. The area has been fenced off, overgrown and inaccessible for as long as I can remember. I’ve often peered in and wondered whether anything would be built here. I’ve also looked at it from above, from the car park area on Stonebow House, but hadn’t seen this worn stone marker. It suddenly became apparent on a recent wander on a particularly bright late afternoon, when the light hit the old worn lettering at a particular angle. As I’m sure many of us know, the church of St Crux no longer exists, having been demolished in the late 19th century. 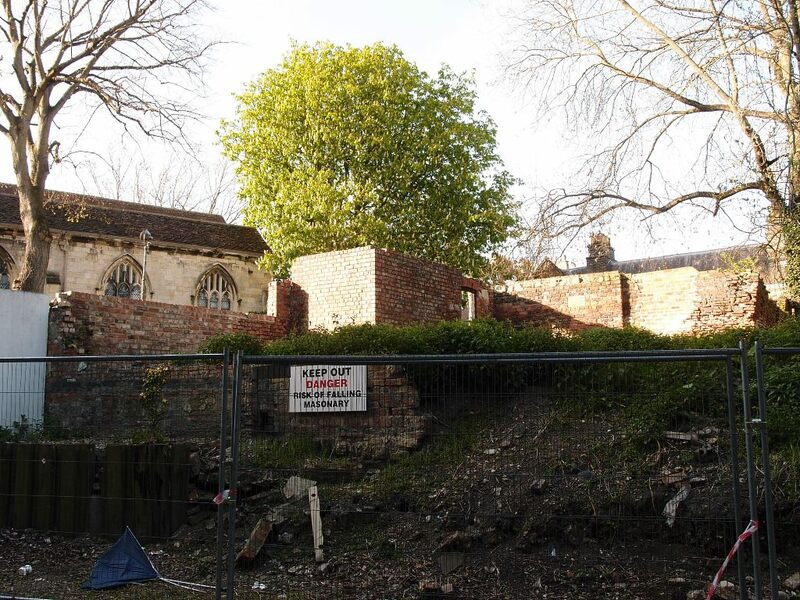 All that remains of it is the small church hall of the same name, near the bottom of the Shambles, on Pavement. Between there and this marker for St Crux parish there’s the massive great bulk of Stonebow House. 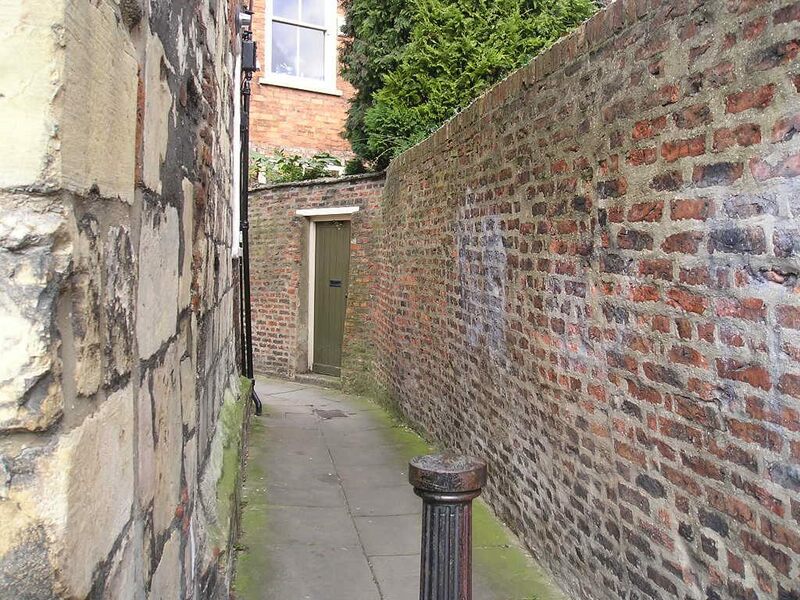 And also between them is what now looks like an access road to the service area at the back of that building, but is actually a remnant of the street of Hungate, before the street called Stonebow cut it in half and obscured the older street pattern. And here on Hungate, as some research revealed, the parishioners of St Crux purchased an area of land to use as a burial ground. It’s marked on the 1852 map. Apparently it still contains headstones, though those weren’t visible through the metal fencing on the boundary and the walls and foliage. I’m glad I noticed this now barely readable sign before it erodes even more, but I’ve found no other information on this interesting and rather forgotten piece of land stuck behind Stonebow. Could it be built on? What are the plans for it? Could it be turned into a small park area? 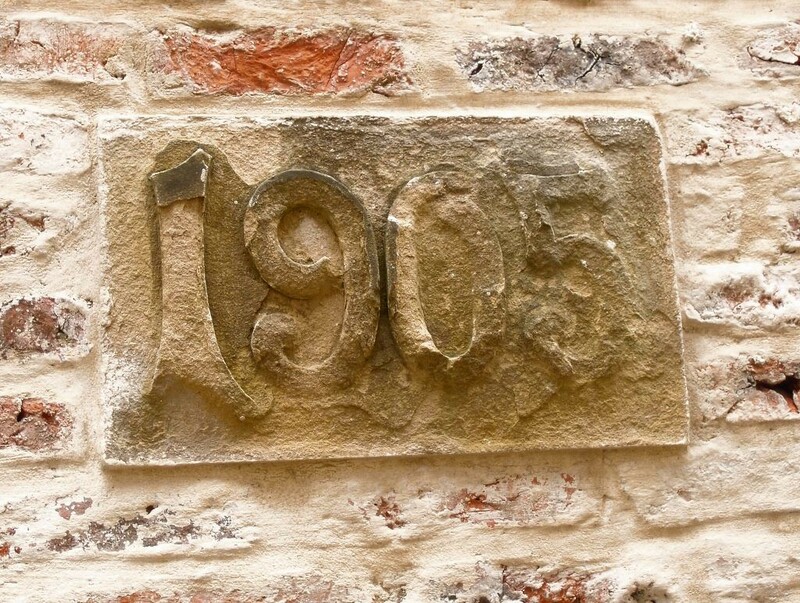 This ‘1905’ stone has appeared in the boundary wall of the alley by the church. The wall seems to have been rebuilt at some point quite recently. As far as I’m aware, and as far as I can tell from that photo and others, that ‘1905’ sign wasn’t part of the wall before. Or was it? Is it just something else I didn’t notice, because it was grubby and indistinct and the light didn’t hit it at the right angle? I’m doubting my own powers of observation, but I’m almost sure it wasn’t there before. 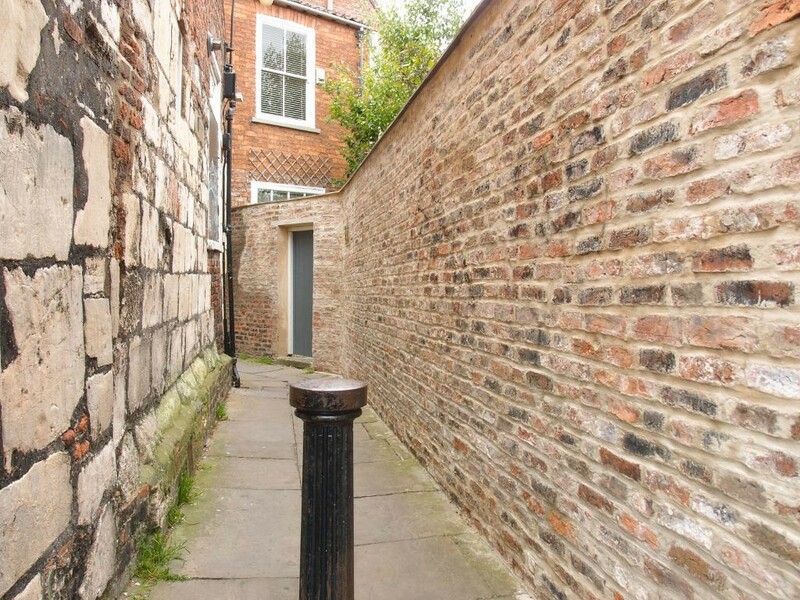 That photo above was taken many years ago, for a page on the original ‘York Walks’ pages version of this website. But I’ve walked down here many times since. This rebuilt wall must have been rebuilt recently. On that early page I said how much I loved this little alley. Not so sure now. Perhaps the older wall was seen to be unsafe, and had to be rebuilt. 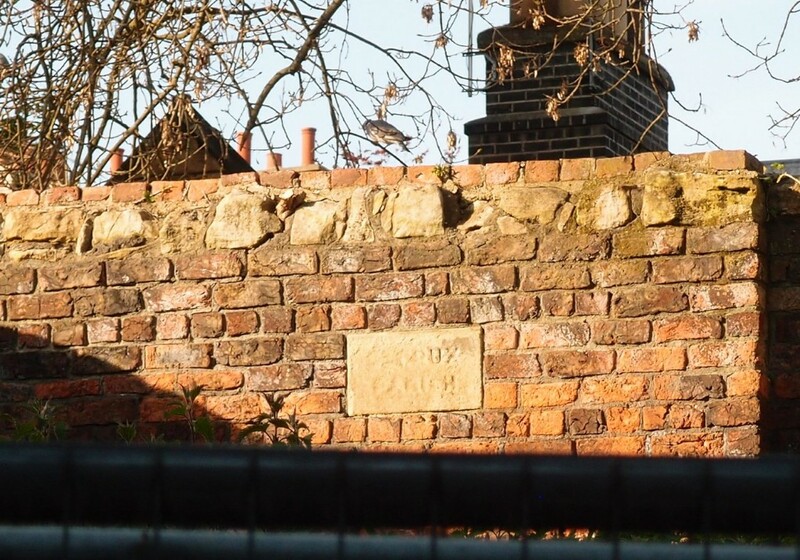 But why, I wonder, does it now have a stone set into it bearing the date ‘1905’. It’s a little mysterious. Still, a little mystery adds to the interest in the winding streets we wander in this multi-layered place. By Lisa @YorkStories • 5 June 2016 Details, Signs and symbols To link to this page's proper location please use the > permalink.